8 Days Tour From Kyrgyzstan Osh to Dushanbe via Pamirs, Murghab,Zorkul lake, Wakhan valley. Welcome to Kyrgyzstan ,Osh to Tajikistan Dushanbe Wakhan,Khorog, Dushanbe! We look forward to recieve our visitors from middle of April to end of October, even in winter time too, who wants photo safari of winter landscapes and wild life, such as Marco Polo sheep, ibex, fox, wolf, snow leopard,etc. Dear visitors Welcome to Tajikistan and Pamirs, we would like to share our beautiful scenery, nuture, traditional and ethnic ceremonies, festivals, also an route of your trip visit the historical ancient sights, hot springs sweming pools, museums, botanical gardens, traveling the less traveled gorges,watching seeing the wild life, unsteped beautiful nutures in the eastern Pamirs, Kyrgyz and Tajik nomadic life's. When you are in the summer pasture staying in the yurts there is very basic accommodations. In this area traveling basic accommodations and simple typical food menu. We would apriciate your information about your normal use food, we look forward to arrange food by your order. Our company based in Eastern Pamir Murghab region, we have team of guides and drivers they are very polite and helpful for tourists. Most of guides English speaking, some of the drivers speak in English well, some of them so so, but all the drivers experienced well of location and driving expirience where ever by their well equipped cars. 1 Toyota Landcruiser 100 and 105 models. 3 Toyota Haice minibus for more than 4, 5 people. Our driver, will meet you at the airport, railway station or border with a sign with your name and surname on, and will take you to the hotel you have booked. If you request a guide we will provide them - either for specific days or for the whole trip. Pamir Off-Road adventure's 8 days expedition. 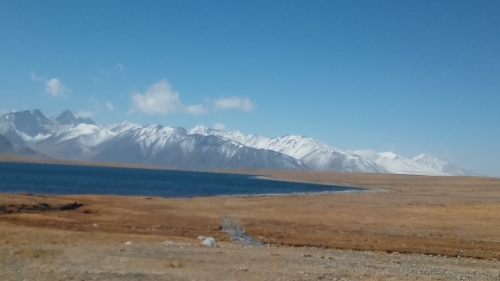 Day 1 Osh to peak Lenin Tulparkol lake. In the morning you have time till lunch exploring the old city Osh, Solomon's hill, cave museum pilgrims of Sulaiman's passed through this area, at the top of hill ponaramic views of city Osh, visit the local central market it is famous enough in the area Osh market, on Saturday and Sunday there animal market before departure quick visit animal market it will be good enough fun and experience for you, after lunch leave for Tulpar kol via Alai and Chon Alai valley, best scenery of TienShan and Pamir Alai high mountain transaction, Chiyirchik, Taldik,Katin Art passes are not high compare the passes tomorrow in Pamir, at that lower passes Kyrgyz people comes with their animals for summer pasture with yurts in the alp, stop for having conversations with that nomad people and taste the Horse milk, cow, yak milk products such as Airan, Kymyz, Kurut. There your driver will be attentionally look forward to catch the local ceremonies, festivals, horse game as Kokbooru. Get to Tulparkol yurt stay.BLD. Day 2 Tulparkol to Karakul alp lake 3950m. In the morning take a walk around yurt camp have a beatiful scenery of peak Lening and lakes sunrise views from up the hill behind the yurt, after breakfast leave to Pamir Karakul lake, today you'd cross the country borders, each border control will take half an hour, after Kyrgyz border rive up to Kyzyl art pass 4282 m, at the top of the pass welcoming sign of Tajikistan Pamir stop for photo, there also border control check points, across the border an half an hour you ll see the largest lake Karakul, enjoy the beatiful landscape of the area, there is a small village 800 people lives, after lunch explore the village walk to the lake, see the high mountains, home stay Saadat.BLD. Today you'd drive through second highest pass Akbaital 4655m, en route visit the First Russian fort belongs to 1873 years, before Russians came that building was a caravansarray during the Silk Road, at the top of pass have a break, photo and short hike, before getting Murghab you'd visit one of alp summer pasture Gumbezkol in the Pishart valley be there couple of hours see the yaks and be witness of of nomad life, then drive to Murghab town it is a capital town of the region, population 17000 , majority is Kyrgyz people, home stay Eraly.BLD. Day 4 Murghab to Jartygumbez, Mashaly. Today you ll have chance to travel the wilderness area and real nomadic postural life through less stepped remote summer pasture in the high altitude. In the morning sightseeing of Murghab town, local market, central squire Lenin statue, handcraft women community hand made products shop, having conversations with local poeple, then leave to Jartygumbez via Shahkty cave rock paintings and wild life watch such as Ibex, Marcopolo sheep, fox, wolf, etc. get to Jartygumbez there is a nice swimming warm pool have swim and relax after lunch drive up to Mashaly summer pasture altitude is 4250m, there yurt camp, you ll see the Pamirs yaks, sheep,goat, enjoy the amazing landscape, you can walk around the yurt camp, feel the wilderness quite time and fresh air. Sleep in the yurt.BLD. After breakfast leave for Langar via lake Zorkul most interesting day driving by Off-Road wilderness of Pamir area we"d stop at several yurt beeing witness of nomadic life, lakes short hiking at shore of lake wild life observe such Marcopolo sheep, Ibex,mountain goat, diffirent kinds of birds, you"d feel the life in wilderness. Accross the river Afghan poeple lives in yurt at their summer passture, afternoon we get to main rote to Langar at stop for photography of lanscape, see the Ratm fort wich belongs 1st 2 nd centure BC. early evening get Langar home stay Misha. BLD. Day 6 Langar to Yamchun (Biby Fotima hot spring). Langar you follow the Afghan border perhaps you'd see Afghan caravans across the Panjanj river, at lunch time get to Langar after lunch kl imbuing the hill for seeing the petroglyphs face of the rock there are hundred of petroglyphs, it will be take one an half hours then continue the trip to Yamgchun an route visit the Buda stupa in Vrang village, Sufi museum in Yamg village, drive up to gorge top of the pass you stop for sightseeing of Yamgchun fortress then get to the guesthouse Pamir it is near by Biby Fotima hot spring there is a swimming pool have nice swim and relax at the beautiful gorge seeing the Hindu Kush high mountains. Guesthouse.BLD. Day 7 Khorog to Khalaikum. Today you ll have chance to see the Afghan poeple in the market if if is Saturday every Saturday in Khorog and in Ishkashim there is market between Tajik and Afghan's, before to leave Khalaikum visit the Afghan market for couple of hours early then leave to Khalaikum via Rushan village and cross the Bartang river by the bridge, Vanj river and Vanj valley, across the river Panjanj Afghanistan whole day scenery of Afghan side see the poeple which they are swimming in the strong follows dirt river Panj, poeple are both country have Islamic dress and long beard because these two countries poeple are Muslim, spectacular scenery of the landscape in this area you ll have lot of experiences and it will be one of the interesting unforgettable trip in your life. Get Khalaikum home stay Roma.BLD. Day 8 Khalaikum to Dushanbe via Kulob. In the morning and Dolores the small town Khalaikum after breakfast leave for Dushanbe via souther route Kulob the first 100km you have chance see the Afghan villages after Shurobod pass get to Kulob visit the historical sight of Mirsaidaali Hamodonie's museum and Madrassas complex, lunch in Kulob, next stop in Khulbuk there is a Khulbuk fortress belongs to the 9, 11 th centuries. Then to Dushanbe through Sharshar pass and tunnel top of the pass views of the Nurak dam, the lake is green color looks spectacularly scenery from the pass, welcome to Dushanbe capital city of Tajikistan. Accommodation will be booked by yourself.BL. Thanks a lot for your choice! At your discretion, we can change the tour details. We are always ready to give you our best service! Phone: + (992) 900 50 30 76., Mobile: + (996) 558 58 48 90.